I recently saw this recipe on Semi Home made with Sandra Lee. 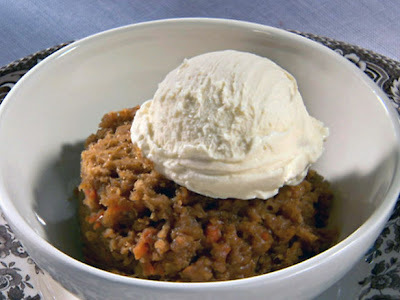 It's pretty much the same recipe as the Warm Chocolate Pudding Cake that I posted a while back, but it just substitutes carrot cake ingredients instead of the chocolate cake ingredients. FABULOUS! It's warm and gooey and more like a bread pudding than a cake. OH so yummy! And one of the best parts about it is that you make it in a crock pot , so you can do it early in the day an it'll be ready for tonight's dessert! Spray a 5-quart slow cooker with butter flavored cooking spray. Combine all ingredients in large mixing bowl. Beat with an electric mixer on medium speed for 2 minutes. Transfer to slow cooker. Place a couple paper towels over the cooker and then place the lid on top. (this will absorb the water that forms under the lid from the steam). Cook on LOW for 4 1/2 to 6 hours. Serve it warm as is, with a scoop of vanilla ice cream, or with a scoop of my Cream Cheese Frosting Ice Cream. When I made it, I could only find sugar free instant pudding, so I went with it. I also used regular vegetable oil instead of canola oil. Turned out great! 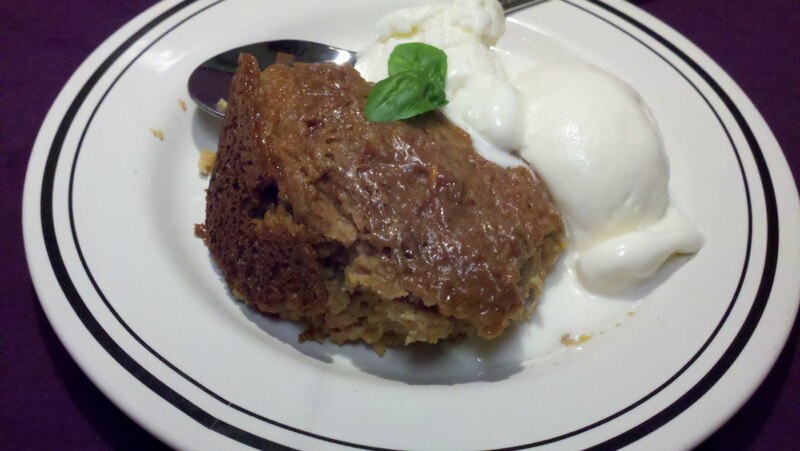 I like a really spicy carrot cake, so I added a teaspoon of pumpkin pie spice. I probably would have added some coconut too, (since I love coconut in a carrot cake) but I didn't have any on hand. I'm sure I'll add some next time! The crushed pineapple is a nice touch, but you can just omit it if you and pineapple don't get along so well. When I made it, it seemed to take a little longer than 6 hours to cook all the way through. Maybe all crock pots are not created equal, who knows? Just keep an eye on it and let it cook until it's set all the way to the center. Oh, btw, sometimes I can't seem to get the photo to be just right, so I just decided to borrow the one from FoodTV.com. I hope they don't mind! It would be nice if you added a "Print Friendly" way to print off the recipe. It sounds great. I'm going to make it tomorrow for my son-in-law's birthday. As for the printing, all you have to do is use the print preview and print what you want. I am also going to make this cake for my grandson.. This was AMAZING! It reminded me of a carrot, pumpkin cheesecake. Everyone who tried it absolutely loved it. It did not burn so I was able to get it out of the crock pot and place it on a plate. It looked and tasted fabulous! Good job Joey!! I will be making this every Thanksgiving from now on! Sounds delicious. Kim C if you are reading this did you add pumpkin pie spice to make it taste of a carrott, pumpkin cheesecake? nutmeg. And yes, I did add seasoning. Can you bake this is an oven? I've never tried it in the oven, so I'm not sure how it would turn out. I guess there's one way to find out!